To the Mumbai music audience, Guitar Hall occupies a place of prominience,in the mind, by virtue of its training, location and services,, endearing itself to its students. Headquartered in the heart of Chembur,in a strategic location and conspicuous position, Guitar Hall continues to be the place every music lover and professionals alike gravitates to. From Top notch training, highly skilled teachers to having a wide spectrum of guitars for sale at their boutique, Guitar Hall has evolved in a decade into a one-stop hub for the guitar oriented, be it the beginner-student, the tutors or the guitar virtuoso. What drives the organization is the Guitar Hall motto, “No shortcuts…no quick fixes” lived in letters and spirit which they till this date adhere to. In 1998, Guitar Hall revolutionized contemporary music education in India with the first full-time program to offer hands-on professional training for the guitarist. Over a decade later, Guitar Hall remains the leader in guitar education in India with a unique system that combines technical, creative and professional development in a performance-based program. At Guitar Hall, students learn from a proven curriculum taught by the best guitar instructors in India, augmented by guitar workshops by visiting guitarist’s, seminars, and lessons from some of the greatest guitar players in contemporary music in India. Having trained more than 1500 students till date, having a diverse and talented student body from throughout India, Guitar Hall is India’s first & foremost guitar training lab for the music of today—and tomorrow. 2) Study Material and supplements. 4) Practice Rooms & Instruments. 5) Guitar Competitions with press coverage. 10) Mentoring for deserving students. 11) Training for Trinity college London grades. 12) Intensive lead guitar training. 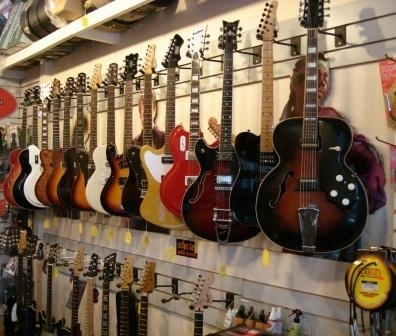 13) Vast range of guitars for sale at the boutique. Top guitar classes in mumbai.